In this review, we look at the Samsung Series 9 NP900X3C - a high end 13.3" ultrabook, offering the Intel Core i5 3317UM 1.7GHz, 4GB RAM, a lightning fast 128GB SSD, all running on Windows 7 Home Premium 64-bit. The NP900X3C is both incredibly slim and light, well designed, and for such a small package it offers incredible computing power, all wrapped in a beautiful aluminium casing. This exterior gives the NP900X3C ultrabook a great degree of stiffness, which we feel will offer protection to both the notebook and it's screen. The 13.3" display offers a beautiful picture, as good as we've seen on a notebook, and the entire laptop weighs just 1.1kg - incredibly light, so ideal for commuting. Read on for our Samsung Series 9 NP900X3C review. 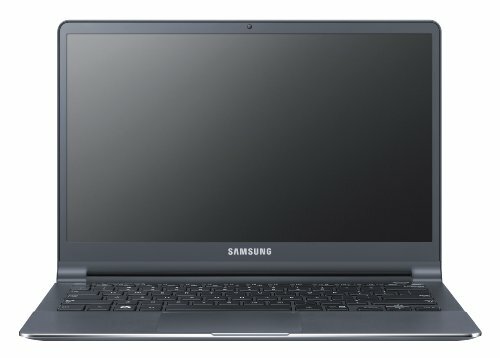 Below is our review of the Samsung Series 9 NP900X3C, a 13.3" laptop, featuring 4GB RAM, 128GB hard drive and Windows 7 Home Premium 64-bit. Samsung have a reputation for creating some of the industries most attractive notebooks, with a great deal of thought being put into the design throughout their ranges of laptops - and as you'd expect, this attention to detail is continued for their Series 9. This series is situated at the higher end of their ranges, and as such you'd expect a high standard of components, specification, performance, and design - and in the NP900X3C we feel you will not be disappointed. The exterior is manufactured from aluminium, which provides incredible stiffness at a low weight - both the screen and the actual body have very little flex in them. This, when combined with the small dimensions and low weight, make this ultrabook the ideal notebook for travelling or commuting - it's not going to take up much room, and should be tough enough to put up with general wear and tear associated with travel. A slight downside to this ultrabook is the fact that it may be difficulty to upgrade should you wish - there are none of the usual access panels to change components. That said, the notebook offers a pretty good spec, and it may be several years before you are in a position where you'd like to upgrade. Being an ultrabook, the display of the NP900X3C is slightly smaller than the average laptop, at just 13.3" instead of the standard 15.6". But what it lacks in size, it more than makes up for in picture - Samsung have named this technology PLS - this offers amazing picture quality from all angles, which is fairly important considering the smaller size of the screen - no washed out colours, no matter which angle you view from, this screen offers great viewing. The colours display vidily, and the brightness is excellent, even in the sunlight, helped in no small part due to the anti glare coating - reflections are drastically reduced, making it easier to concentrate and reducing eye strain. The resolution is an impressive 1600 pixels by 900 pixels, which is approximately a third bigger than your average netbook - enabling you to fit more on the screen at any one time - ideal for multitasking applications. In short - absolutely no complaints here, Samsung have clearly put a lot of thought into this small but perfectly formed display. The 1.5W speakers offer excellent sound, especially hen you consider the size of the notebook. The bass is pretty deep, and although audiophiles will no doubt invest in a decent pair of headphones or external speakers, most users will be happy to with the audio output. Despite the relatively small size of this ultrabook, they've also fitted in a considerable amount of options in terms of connectivity - an AC power connection, one USB 3.0 port, one USB 2.0 port, HDMI, Ethernet and VGA (all via dongle), a SD card slot, and a joint headphones / microphone jack, all of which should provide enough options for most users. Inside you'll find the Intel Core i7-3317U dual-core processor, as well as 4GB RAM - these, when combined with the speedy 128GB SSD keep applications running extremely fast - you should have no issues in this department - in fact the only tasks it may struggle to handle are HD video editing/rendering and playing the latest games on the highest graphical settings - however, this 13.3" ultrabook was clearly not designed with those purposes in mind. That said, we were impressed at how fast it ran - especially the start up time of under 15 seconds. Battery life is pretty good - it was around seven and a half hours for our test between charges, during regular usage. The backlit keyboard is comfortable to type on - each key has a relatively short action, and pretty silent - however it is not in the slightest bit difficult to gauge whether a key press has been sufficient to register input. The body is very stiff, due to the well designed construction, and this makes typing easier and more reassuring. The surround is all one piece, combined with the handrest - this too helps limits flex, and gives the notebook a more expensive look and feel. Similarly the touchpad, or clickpad to be exact, is generously size, and has a subtle matt surface, offering excellent and accurate control of the notebook. So all in all, what do we think of the NP900X3C? Pros: The build quality is amazing, the 13.3" display is excellent, as is the keyboard, the speakers, and the battery life. Cons: Hard to find fault - if we're being fussy, it may be difficult to upgrade, and due to the small size it only provides 2 USB ports. Granted, it is at the higher end of Samsung's range, however you do get a lot of laptop for your money. Overall, it is small but perfectly formed - offering lightning fast computing from it's tiny dimensions. Ideal for those who travel - great battery life, small dimensions, low weight and decent build quality will make the Samsung Series 9 NP900X3C appealing to those on the move. It may be a touch small for those who wish to use it for long periods of time as their main computer - however as an addition to your suite it offers great value and practicality in a stylish design.